The Deal: These bikes are available SEE PULL DOWN MENUS. Order now to lock in the current sale price and selection. The price may be up to $100 more later this year. The Process: When you order, your card will be billed for the full amount. You will then get an automatic email reply by the next business day. For example a Friday order will get an email on Monday. Weekends/Holidays are not counted as "days". Your Shipping Address: Please ensure your shipping address is correct when you place your order. Last minute address changes will incur delays and/or extra costs. Your shipping address can be changed on the 3rd page of the checkout process by clicking on "change" beside the address. 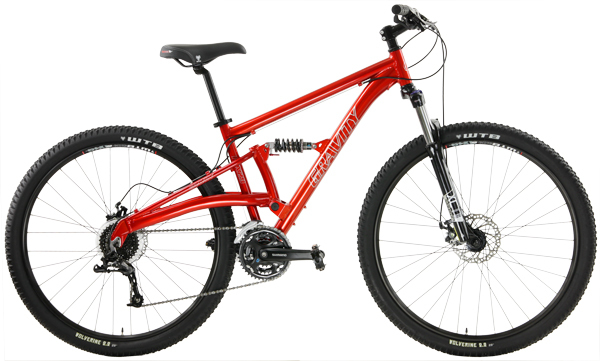 We have sold thousands of Gravity FSX Full Suspension Mountain Bikes. 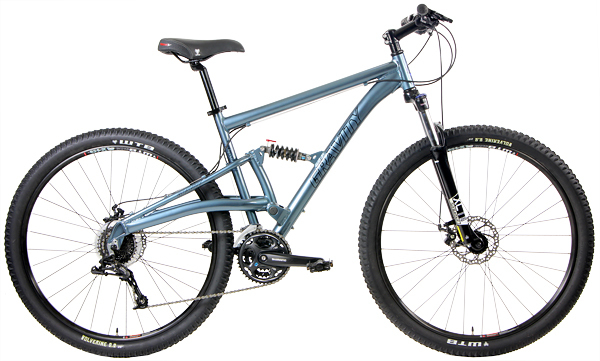 This full suspension frame has some of the best quality and design for the money we have seen. Customers who own FSX's send friends and family to buy these excellent bikes all the time. "... this bike is all me!I can fly down hill on this bike and stop on a dime, or veer hard with it…Going up hill, if you got the leg power and the lungs it'll do it....get a lot of compliments on the bike's sleek look too." "..a great bike so far. Looks dope, and rides good! Also, super quiet....Personally, I'd give it a 9/10." Buy Your FSX now with shipping included to 48 states. FSX Full Suspension mountain bikes feature Advanced Aluminum frames with a Hydroformed tubes, advanced CantiBeam single-pivot rear suspension and trail-ready geometry. Powerful disc brakes and wide range SRAM/Shimano drivetrain for smooth shifting on rough terrain. The plush Suntour suspension fork further smooths the terrain. Advanced lock-out provides maximum efficiency at will. Incredibly specified with precision SRAM derailleurs, Best Shifting Shimano Cranks, strong WTB Double-wall rim wheels, Powerful Disc brakes, Lockout Suspension forks. 15 inch = Small | Standover = 28" | fits* 5'6" to 5'9"
19 inch = Medium/Lr | Standover = 29.75" | fits* 6'0" to 6'2"
21 inch = Large/XLrg | Standover = 30.75" | fits* 6'2" to 6'5"
Hubs F/HUB	:	FORMULA DC19 ALLOY BLACK W/QR. R/HUB	:	FORMULA DC25 ALLOY BLACK W/QR.